​fastest growing social service of our time. 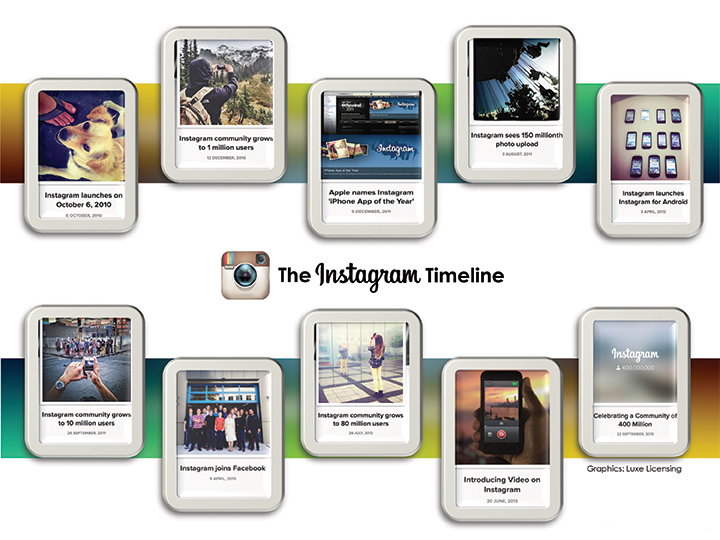 The first Instagram photo was uploaded on July 16, 2010 and the site has been growing exponentially ever since. Global Jewelry Influencer, Russian-born Londoner @LizaUrla, with 57,000 followers, uses key hashtags in her posts and asks questions, such as Which designer do you think this is? to help spark engagement. Kendall Jenner wins the most popular post in the history of Instagram, also demonstrating that hearts, in most any form, ignite likes. 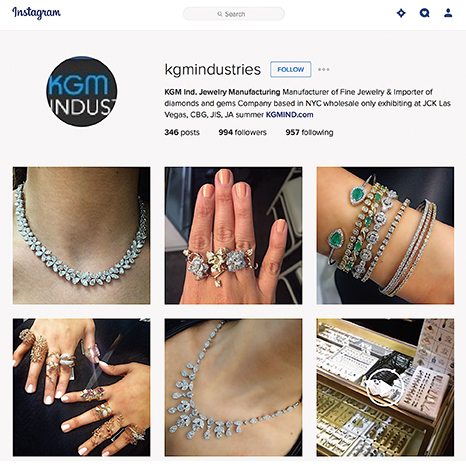 An example of a jewelry company with growing awareness of the benefits of Instagram is New York-based KGM Industries. 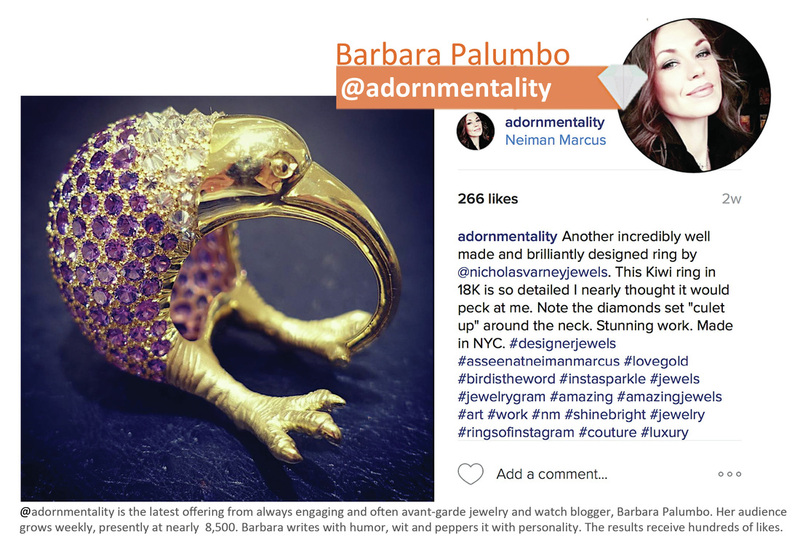 @adornmentality is the latest offering from the always-engaging and often avant-garde jewelry and watch blogger, Barbara Palumbo. Her audience grows weekly, and is presently at nearly 8,500. Barbara writes with humor, wit and peppers it with personality. The results receive hundreds of likes. 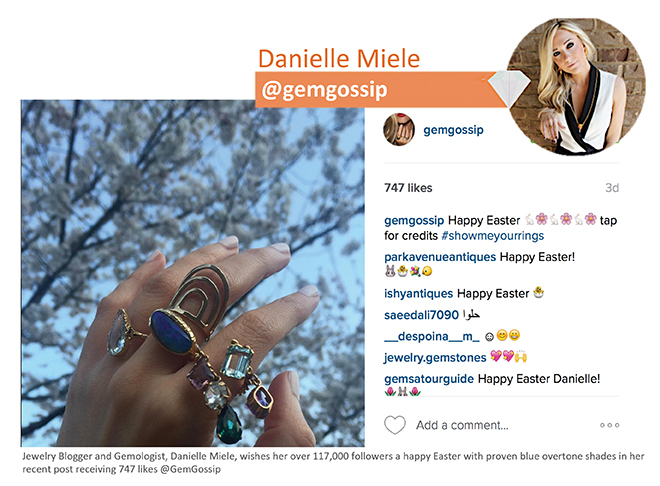 Jewelry Blogger and Gemologist, Danielle Miele, wishes her 117,000+ followers a Happy Easter with proven blue overtone shades in her recent post, receiving 747 likes @GemGossip. Post proudly. That may be the motto of Estelle Hedaya, @chachacha3869 (right), operations director of the CBG and Preferred Jewelers International. 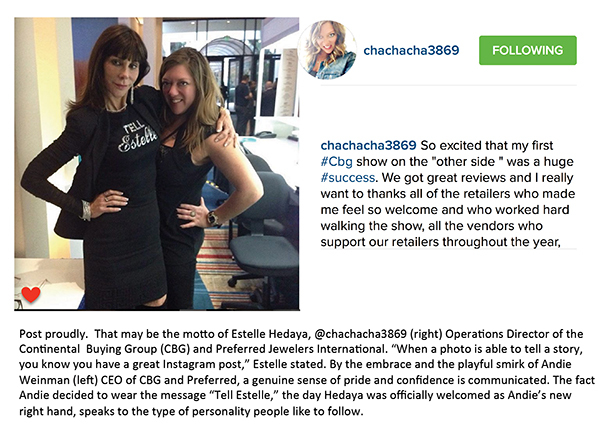 “When a photo is able to tell a story, you know you have a great Instagram post,” Estelle says. By the embrace and the playful smirk of Andie Weinman, CEO of CBG and Preferred, a genuine sense of pride and confidence is communicated. That Andie decided to wear the message Tell Estelle, the day Hedaya was officially welcomed as Andie’s new right hand, speaks to the type of personality people like to follow. Before you dive into any new social media platform, it’s best to of get to know it a bit. Some may need a crash course on Instagram, while others may wish to skip ahead to INSTAGRAM NOW. Let’s get started. Get the App: Start off by getting the free app from itunes.apple.com (Apple App Store) or from GooglePlay. Hello, I’m...: Select a username and profile picture that best represents you. You may change either at any time, but be creative. Look at other profile pics and usernames before making your deci­sion. Follow You, Follow Me: Follow others, as well as your friends and family, to connect and acquire followers. More followers equals more possible likes and shares (engagement). You’ll read how soon. Post It: Posts are the photos and videos you choose to share on Instagram. To create a post, select the camera tab and choose a photo or video from your phone’s library or take one with the app. Then edit the photo and add filters, if you want. Next, add a caption and then share it. #Context: Hashtags are used to find and give context to your post or comment. I get into some specifics later in the story. Location, Location, Location: When you post a photo or video, you can choose “Add to Photo Map” to show your location. This may or may not be something you want to share, so be careful when you use it. By Invitation Only: Instagram Direct allows you to send pictures or videos privately to up to 15 people. On the home screen in the top right corner, there is an Inbox symbol. When you tap the symbol, the screen shows direct posts that you have sent or received. To send a new direct post, tap the plus sign in the top right corner or choose the camera tab and go to the direct setting after you have chosen your picture. Look Around: The Explore tab, represented by a magnifying glass, lets you see recommended or trending posts and accounts. When you search, your recent search history pops up, including the hashtags you use most often. The People tab allows you to search for other users by username or full name. The Tags tab allows you to search for posts with a particular hashtag. The Places tab lets you look up posts made in various locations. In the News: The news feed consists of the most recent posts of the users you follow. Every time you log into Instagram, you’ll see your feed. You Gotta Have Heart: If you love another person’s post, you may show everyone you like it by double tapping the heart. This is Insta­gram thumb’s up symbol for like. Activity Feed: This tab is shown by a speech bubble with a heart in it. There are two parts to the activity feed: Following and You. The You section tells you if any­one has followed you, or has put in a request to follow you, tagged you in a post or comment, com­mented on your posts or liked your posts. The Following section shows the recent activity of users that you follow, including pictures they’ve liked and other users they’ve followed. What’s Your Take? To comment on someone’s post, press the speech bubble under the post, write your comment and then submit it. Keep in mind that comments are not anonymous, and people can report comments as inappropriate. Facebook’s billion-dollar acquisition of Instagram has now been valued at 35 times the initial price tag. That value is increasing, as the service proves to be a committed part of the youth of America as well as for those who know how to benefit from it. Instagram boasts over 400 million monthly users, of which 27.6 percent (77.6 million) live in America. And, the USA-based group is nearly evenly split between males (51%) and females (49%). Forecasts project Instagram to exceed 106 million by 2018 for those living stateside, which is the audience focus for this story. Some 87 percent of Instagrammers in the USA are aged 35 or under and three million teens rank Instagram as “their most important social network.” Yet, there are many reasons beyond this attractive, youthful demographic to embrace this platform. After all, it is the fastest-growing social site in the world and one that can help you and your business. Clearly, Facebook continues to be the Number Onesocial platform, with 1.6 billion monthly active users as of January 2016. The power punch of Facebook and its sister company, Instagram, is the new social media defacto duo. While I have written extensively on Facebook recently, this story is focused on Instagram, yet there is a need to note a specific Facebook fact that was predicted from my last story in the September issue of Jewelry Showcase because it also affects Instagram. Many brands were burned by Facebook’s most recent news feed algorithm change, which inserted a pay wall between brands and their communities. Those same programmers have just allocated serious resources to optimizing all Insta­gram content, meaning content that pays the bills is moved to the front lines. People are still are in control, though. Con­sumers conclude what to heart or not and what to share and whom to tag. By clicking on the three dots to the right of an image, you can tell Instagram you want to see that con­tent first. Even though many leading analytics, Forbes, Wall Street Journal and other business publications are calling this Instagram move a brand killer, remember we can learn from Facebook. To move strategically into the future, we need to peer into the past. July 16, 2010: That’s the day the very first “Instagram” pho­to was uploaded, but no one saw it since it was called “Burbn,” a clumsy knock-off of FourSquare with no funding or fol­lowing. Kevin Systrom, a Stanford grad and a former Google employee was walking on the beach with his girlfriend when the idea hit. They were discussing how she couldn’t take a good photo when they saw a stray dog. Kevin took out his iPhone and snapped a shot. The picture was very candid, with his girlfriend’s flip-flop-clad foot sharing nearly the same space as the dog. That photo was the initial spark to the flame. Note: Next to cute babies, dogs seem to always make the top two most popular posts, anywhere, anytime. October 6, 2010: Eight weeks of re-coding and the right VC pitch brought Instagram to life with an initial invest­ment of $500,000 from Baseline and Andreessen Horowitz. It went live as an iOS (Apple only) app. Systom recalls he was shocked to see that more than 10,000 users had uploaded photos from across the globe just within a few hours of the free photo share app on the Apple storefront. How was this possible? They used simple, proven concepts and made them very easy to use. To this day, the best of online and best selling consumer magazines are mostly im­ages. Think about it. Facebook is primarily photos, as is Pin­terest. Add an easy photo enhancement tool to edit your shot, eliminate the need to type words; like or heart an image with a double tap; follow people with one touch. 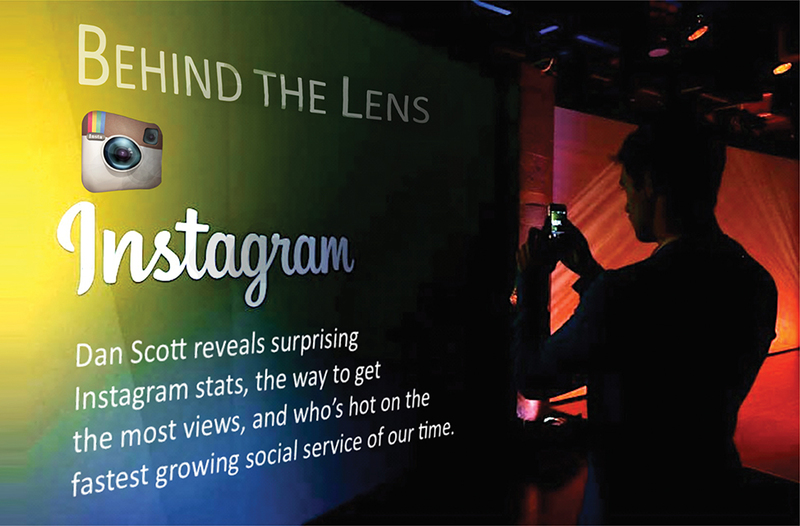 A few months later, Instagram had 1.75 million mem­bers, who were uploading some 290,000 photos per day. The growth has not slowed down. Even after significantly more funding, the company was kept to less than ten employees. A few months later, Instagram had 1.75 million mem­bers, who were uploading some 290,000 photos per day. The growth has not slowed down. Even after significantly more funding, the company was kept to less than ten employees. The focus was all on the coding and scripting. The rest went into marketing. January 2012: A milestone for Instagram, when it hit 15 million registered users. By the end of March, that number jumped to 27 million. Then, news leaked that In­stagram was planning on raising $50 million at a $500 million valuation. Four days later, Facebook acquired Instagram for $1 billion. The company is now valued at $35 billion and growing. Most Liked on Instagram: Hearts are not only the way you like something on Instagram, they are very popular in many ways. The most-liked photo of 2015 belongs to Kendall Jenner. The image of her lying down, with her hair spread our around her head in a sprawling crown of hearts, generated 3.5 million likes and 162,600 comments. Realizing that being a Jenner or Taylor Swift will get the most views/likes, celebrities and socialites are using heart shapes, heart frames, heart products and hand gestures, which demonstrate that hearts have staying power. Something Blue: To get the most likes (hearts) and engagement on Instagram, try concentrating on color only. Shots predomi­nantly washed in blue get the most likes but it takes more than a saturation slider to attract and engage. In 2014, a company called Curalate analyzed more than eight million Instagram images, reviewing such fea­tures as texture, color and saturation to determine what makes a successful Instagram photo (measured in likes). The actual content wasn’t the focus; it was the mind’s translation of any image in the form of color, shades, texture and a lot of white space within the composition of the shot. The findings received a lot of attention, so you’ll want to make some of your photos blue, textured and full of back­ground space. • Images with high contrast and/or concentrations of reds and oranges perform poorly. Images with blue as the domi­nant color generate 24 percent more likes than images that are predominantly red. • The more a single hue dominates an image, the more likes it receives. Images with single hue dominance above 40 percent receive the most likes. Currently, the majority of Instagram images don’t have single hue dominance—90 percent are be­tween 0 to 20 percent single hue dominance. • Images with 0 to 15 percent color saturation (or little color) generate 18 percent more likes than images with more vi­brant color (20 to 40 percent saturation). It’s simple to ascertain the two (and whom you should fol­low) by simply reviewing the followers’ own fan base and tags. Don’t limit yourself to jewelry exclusive posters. For exam­ple, if you want to follow luxury trends, look at Kelly Framel (@theglamourai). Kelly is a famed stylist and editor of The Glamourai, an online destination for luxury inspirations of many types. Want to see what will be hot in fashion before it hits the racks? Follow @chiaraferragni. This is the voice of Chiara Ferragni, of TheBlondeSalad.com. Chiara is from Italy and travels the fashion world, taking her followers with her. Her competition is Kay Collings (@katcollings) associate editor of WhoWhatWear.com. Jewelry-specific, you might want to follow Liza Urla (@gemologue), Danielle Miele (@gemgossip) and Barbara Palumbo (@adornmentality). There are many others, and if this story is as popular as it seems to be growing, I may release the top 25 jewelry Instagrammers of 2016. Jewelry brands are also using instagram to their ben­efit. 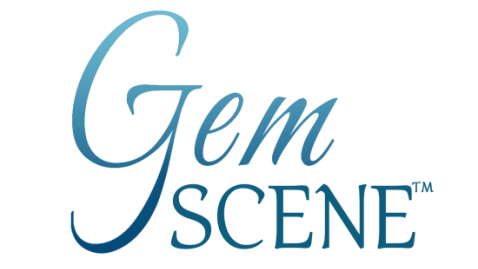 Among them is New-York based KGM Industries, a family-run company selling a wide assortment of jewelry, that started recently on Instagram and now posts daily. Hats off also to jewelry retail­ers such as J. R. Dunn for selling on Instagram, as well as Estelle Hedaya (@chachacha3869) of the Continen­tal Buying Group (CBG) and Pre­ferred Jewelers International for shed­ding light on Instagram’s importance to their members. Speak Hashtag: If you want to have more likes or followers, you can add a comment to your posts with hastags such as such as #Repost, #Regram and #F4F, which means “Follow for Follow.” Then there is #L4L, similar to F4F. L4L means “like for like,” that means someone will like your photo if you like theirs. In the same family is #S4S and a “Shout out for Shout out,” asking people to follow someone in exchange for asking their fans to follow you. Want to share a photo from the past? Use #TBT for “Throwback Thursday,” or #FBF “Flashback Friday.” #WCW stands for Woman Crush Wednesday,” which encourages Instagram users to share photos of the women they admire. Hastags don’t work if you try and add them to photos, they are meant for the comments field. Use “@” before a screen name in a photo tag to single someone out and “take their picture” (using Instagram speak) alerting them to the fact they have been tagged. A recent Instagram add-on is the share function (the arrow after the heart and chat bubble) allowing you to forward the post with a message to anyone you’d like. Young American: To some, Instagram is for “too young a crowd.” My re­sponse to that is “you’re thinking of Twitter.” Yes, Instagram skews young (under 35) but it’s no excuse for not learning the lingo. A large segment of your audience should be the 25 to 35 crowd, anyhow. There is an old marketing saying: “The young never fol­low the old. The old always follow the young.” This is true in all forms of fashion and in jewelry trends. Use Instagram as your youthful photographic look into what is trending, who is posting it and follow those people. You’ll end up learning while enjoying some fantastic pictures. Brand Architect, Dan Scott, can be reached at www.danscott.com.